Massey University Fire & Circus has had a busy month with Food Truck Oktober Feast, Whanganui Festival of Cultures, Come As U R Mardi Gras and the Rongotea Fireworks, just to name a few! It's been great to get out and show off our skills to the public, and see the smiling faces. 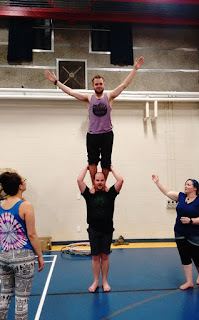 This year we have really reinforced our skills as a fire troupe, and have also seen a welcome resurgence in jugglers of various sorts.. but we don't just juggle balls! 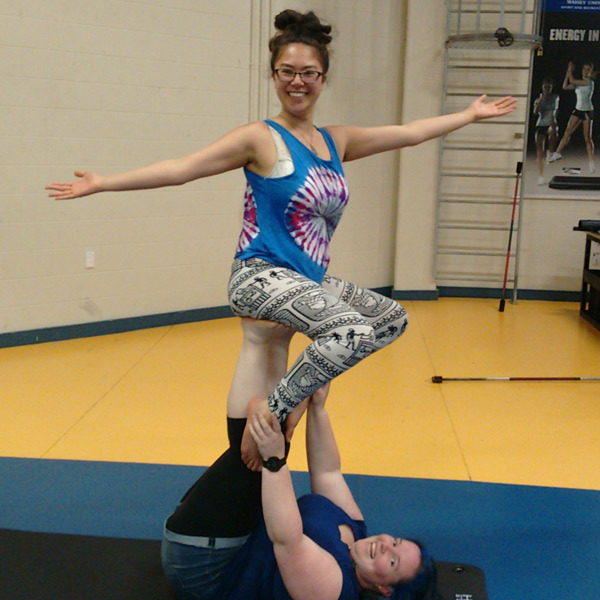 Adagio (which some call acro, or acro-yoga) is an acrobatic art where we juggle people! Technically it's partnered acrobatics, which allows for amazing variations of counter-balance, dance and all manner of mucking around. It can be graceful, elegant.. and at times kinda scary, not to mention, lots of fun. Fire & Circus provides the opportunity for members to train their bodies in feats of balance, strength, flexibility and skill, as we work on high maneuvers, tricks, dance and graceful "flying". It helps that we have a mix of people with a wide variety of skills and talents. Our more experienced members coach newer people as they try out things that are completely new to them, and sometimes really weird, in a safe and supportive environment.. with plenty of room for experimentation and personal expression. As the university year rolls in to a close we are in the thick of exams, but it helps to be able to get the body moving in really fun ways, so we are having continuing practices all through the holidays for those who are still around. Look forwarding to see more new people joining us in the new year!